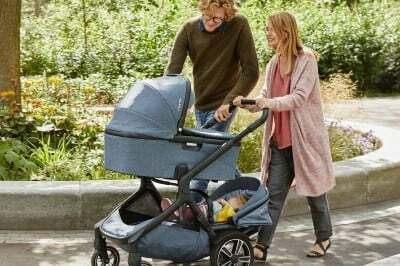 Nuna Demi Grow – First Expandable Stroller from Nuna! Nuna recently presented their new stroller that is going to hit the stores in 2018. All-new Nuna Demi Grow will please even the most demanding parents. As the name says – this stroller is designed to grow with the baby and the whole family! This stroller can be used from infancy to toddlerhood for one or two children – twins or kids of different ages. Thanks to 23 different seating options you will definitely find perfect combination for you and your babies! Parents can start using it from birth with a bassinet or an infant car seat. When the baby can sit unassisted (around 6 months) you can switch to the regular seat. When the second baby comes into the World you can expand Demi Grow to a double stroller. It works with 2 infant car seats, two bassinets, 2 toddler seats or one of each. In my Nuna Demi Grow Review you can read all important information about this stroller features and find out if this is what you need. Convertible strollers that can be used with a toddler seat, infant car seat or bassinet are a standard nowadays. That’s why manufacturers go even further and design strollers that can be not only convert to a pram or travel system, but also expand to accommodate second or even third kid! 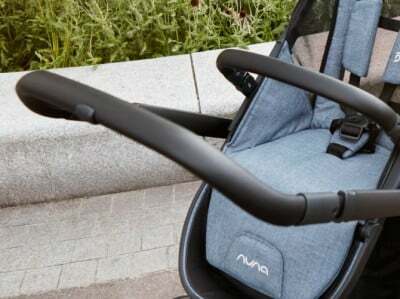 Nuna strollers are designed to be simple and functional. This brand offers few convertible strollers that can be pushed with different seats, however these pushchairs are only suitable for one baby. 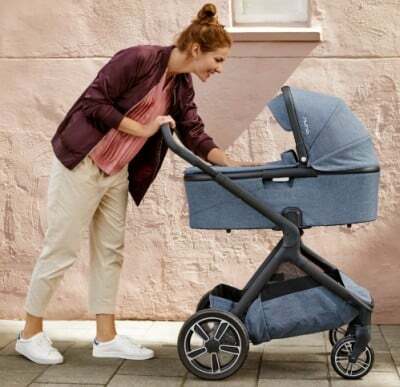 That is going to change in 2018 with brand’s new stroller – Nuna Demi Grow that expands from a single to a double model. 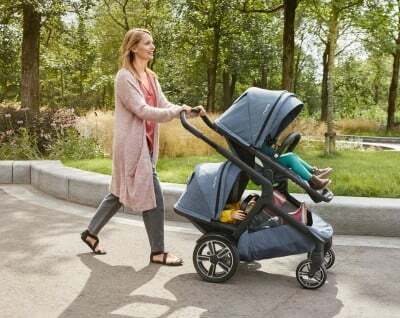 If you are looking for a stroller that easily expands from a single to a double, check my article about the best strollers for growing family. If you need only a single stroller that accepts different add-ons, here are my favorite convertible strollers. You may also want to read my list of all top-quality strollers in 2019. 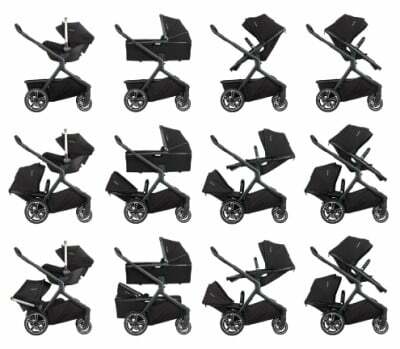 Nuna Demi Grow features 23 seating combinations! It is truly all-in-one stroller. Parents can attach to the frame two toddler seats, two bassinets, two infant car seats (adapters for PIPA car seats – included!) for their twins or they can also mix the seats for kids of different ages. Thanks to so many seating options this stroller is really smart investment and can serve you for around 3 years. Click here to see what’s included in the basic set. This seat is suitable from 6 months, when the baby has neck and head control. Nuna’s regular seat has 3-position recline from upright to flat position. There is also adjustable leg rest with integrated footrest. Reclining the seat and adjusting the leg rest is one-handed. Toddler seat is also reversible, so your baby can face you or the World during your strolls. It’s very useful feature, because when the baby is younger the seat can face you so you could keep an eye on your little one, and when the baby grows you can reverse it so your baby could watch the surroundings (we all know how curious toddlers are). Reversing the seat is very simple, everything clicks in the right spot. There is also a bumper bar that rotates and can be removed for easier taking baby in and out of the seat. The seat is also equipped with 5-point no-rethread harness that is super easy to adjust as the baby grows. There’s one more fantastic feature: this is an all-weather seat as the padding is detachable. The breathable mesh parts (hidden under the seat padding) will be very useful during warm summer days. If you would like to use Nuna Demi Grow for two toddlers, you will need to buy second seat. Good thing about it is that it has the same capacity as the main seat (50 lbs) – it’s exactly the same seat like the included with the stroller (not like The UPPAbaby VISTA Rumble Seat which is smaller than the regular seat). And you don’t need adapters to attach the second seat – so you don’t have to spend extra money! It is suitable from birth to around 6 months. It’s equipped with high-quality comfortable mattress that provides proper position and support for newborn’s back and head. There is also a convenient handle which simplifies baby from the house to the stroller. This carrycot is sold separately. More information about the price and available colors you can find here. Nuna Demi Grow can be also turned into a travel system for one or two infants. 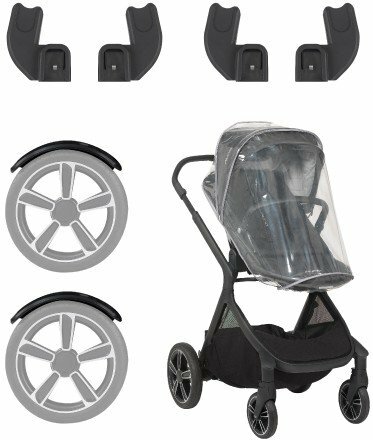 This stroller includes two sets of adapters for infant car seats from Nuna PIPA collection. Moreover there will be also receivers for Maxi-Cosi car seats. Infant car seats need to be bought separately (see the current price of NUNA PIPA). If you want to use this stroller for kids of different ages, you have two options: bassinet + toddler seat or infant car seat + toddler seat. Good thing is that the seat for toddler can be attached in lower position while the bassinet/infant car seat attaches above it. So you can keep your younger baby (newborn or infant) closer to you and your older baby can ride in the bottom seat. Toddlers loves to ride in the bottom, it gives them sort of their own, private, enclosed space. And you don’t have to worry their view is blocked! They still have good view on both sides. Of course you have also other seating options, and the infant car seat can be also attaches an the bottom. When the bassinet is on top and the toddler seat at the bottom, the older child has a bit less space, but at least the seat can be still reclined! Sibling seat is sold separately – on PishPosh Baby you can check its current price and see if there are any discounts right now (check it here). The main seat has really big canopy with flip out sun visor. This sunshade covers the baby really nice. There is also mesh peek-a-boo window which give extra air-flow on hot days. There is also one useful accessory available for Nuna Demi Grow – Dream Drape which ensure that you baby won’t be disturbed during nap time. It gives child privacy and protection from environment. And the best part is that the Dream Drape is included with the stroller – it is hidden in zippered part of the canopy. So when you want to provide your baby with a cozy space for undisturbed nap on-the-go you just unzip the canopy and stretch out the Dream Drape. It’s super convenient and handy! It also provides full shade from the sun and wind, without reducing air-flow! The is also Dream Drape for bassinet and infant car seat. Nuna Demi Grow is equipped with 4 wheels made of high-quality and durable foam. They cushion the ride almost as good as the air-filled tires. Thanks to these foam wheels you don’t have to worry about inflating or having flat tire and your baby can enjoy really smooth ride. 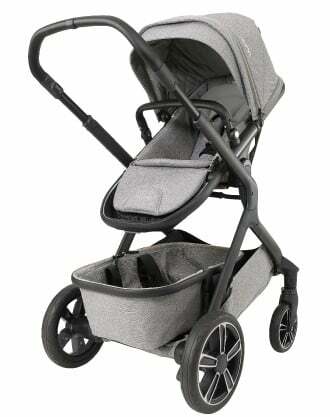 Front wheels are pivoting which makes the stroller more nimble (very useful in tight spaces and corners), but they can be also locked which gives better stability on more harsh terrain. These wheels are pretty big therefore they can handle many types of terrain really well, without wobbling or getting stuck. There is one more great thing about the wheels: there are fenders for the rear wheels that protects parents and the stroller from debris and dirt and prevent child from touching the wheels and getting hurt. You can take this stroller over gravel, muddy trails or puddles without worrying you and the stroller will get dirty. There is also custom dual suspension which also cushions the ride. Thanks to that, your baby will be able to seat and nap comfortably and won’t get bumped-around. The wheels roll really smoothly and the stroller is easy to push, even with two toddler seats. As for a double stroller, it’s very nimble. There is single-action foot-operated brake placed next to the right rear wheel. The pedal is easy to press and lift. This stroller has also an adjustable handlebar to make pushing comfortable for all-heights parents. I love that it adjusts by extension, not rotation, because it gives more spaces behind the stroller for taller parents with long legs. So if you’re tall, you don’t have to worry about kicking the back of the buggy. Under the seat the is a large storage basket which has a special extended design to provide easy access, no matter which seat are you using. However, when the Nuna Demi Grow is expanded to a double version the second seat (regular one or bassinet) partially or completely covers the basket. But you don’t have to worry about lack of storage space. The underseat basket can be removed and converted to a shopping basket (at least the UK version has that option). As other convertible and expandable strollers, Nuna Demi Grow isn’t light and small. It has to be strong to hold two toddlers! The stroller with one seat weighs 27.4 lbs and gets more heavy and bulky when we add another seat (but it’s not so terrible for a double stroller!). The frame has the same size in single and double version, so as for a single stroller it is pretty big, but quite compact for a double buggy. It’s much more compact than regular tandem strollers (not to mention side-by-side strollers!). 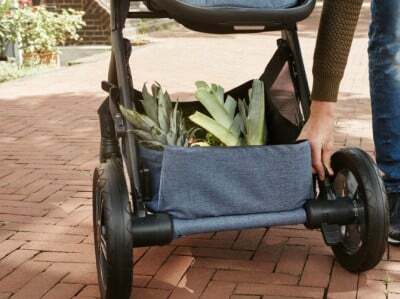 Folding Nuna Demi Grow takes literally few seconds – you just need lift two toggles on both sides of the handlebar and the stroller will collapse. After that the stroller stands on its own and there’s automatic lock that prevents it from opening during storing or transporting. 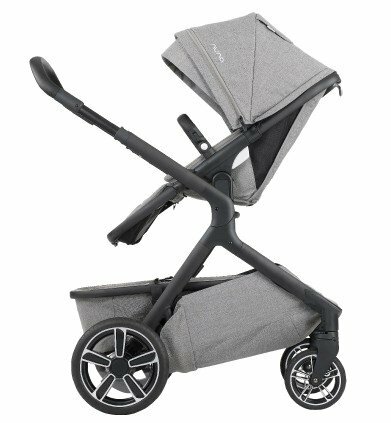 As every other expandable stroller it is quite big even when folded, but you shouldn’t have any problems with fitting it in your car trunk. Keep in mind that folding and storing is easier when the seats are detached. And there is a handle that makes carrying the folded stroller up and down the stairs more convenient. Demi Grow offers luxurious leatherette handlebar and bumper bar which gives the stroller really chic look. The frame is also made of high-quality materials which make it stable and robust. As every other Nuna stroller this one has also softly padded seat. Besides, this stroller looks so stylish and beautiful, so you can be sure you’ll get a lot of compliments from other parents! Nuna Demi Grow includes adapters for Pipa infant car seats (two sets), fenders and rain cover. There are also few accessories that you can buy separately: travel bag, bassinet and second toddler seat. 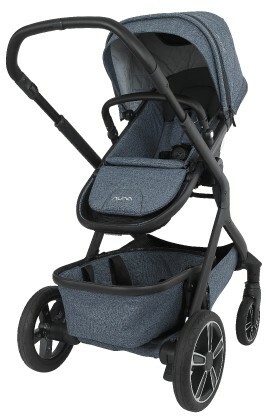 All-new Nuna stroller will be available in 3 colors: Frost, Caviar and Aspen. All fashions look very beautiful and chic. Nuna Demi Grow release date was scheduled for the beginning of 2018 and the stroller was on time! It’s already available on the market! 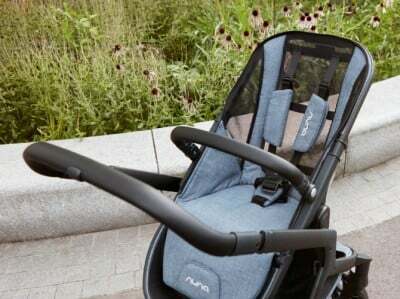 Nuna Demi Grow is a top-quality, expensive stroller. The basic set includes only one toddler seat, if you want to expand the stroller into a double version or simply use it from birth, you will need to purchase the infant car seat, carrycot and sibling seat separately, so it’s unfortunately additional cost. Nuna Demi Grow price is very similar to the UPPAbaby VISTA’s. It’s always good to look for sales and discounts to get this high-end stroller a bit cheaper! 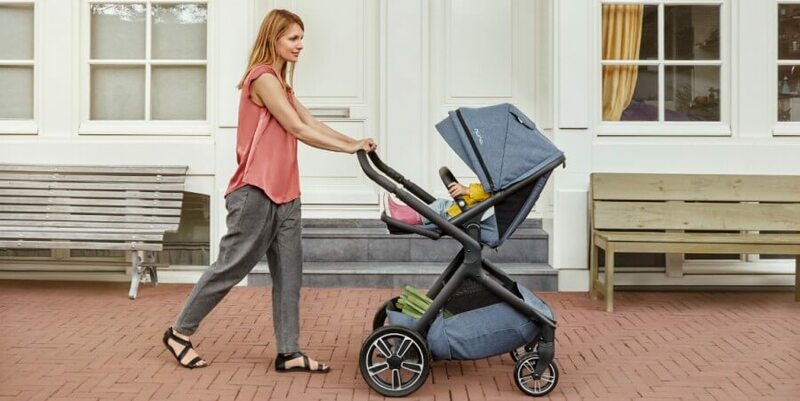 This stroller is awesome choice for parents who have one child, but plan on having more children soon or for parents who already have two kids (twins or toddler and infant). It grows with the baby and adapts when the family gets bigger. With all the seating options it offers it will meet your and your children needs. And you can forget about clumsy double strollers! This one is agile and easy to push and turn even in a double version. It rolls like a breeze! If you’re thinking about buying a convertible and expandable stroller, you may also want to see my review of UPPAbaby VISTA 2018. For a detailed comparison of VISTA and Demi Grow visit Strolleria. Which receivers do you mean? Demi Grow has included two sets of adapters for Nuna infant car seats (Pipa, Pipa Lite and Pipa Lite LX) so you can attach two car seats without spending any extra money on additional adapters. At first, the brand was supposed to release adapters for Maxi Cosi too and sell them separately, but they didn’t release it. So right now Demi Grow works only with Nuna car seats. Hi, does the maxicosi cabriofix car seat fit this?? Unfortunately Demi Grow is only compatible with Nuna Pipa Series car seats and includes two adapters for them. Can you fold the stroller with both toddler seats attatched ? Hey Ash, the sibling seat has to be removed before folding. You can close the stroller with one seat attached. Both seats hold up to 50 lbs or each seat can hold up to 50 lbs separately? Hi Rachel, each seat can hold a child up to 50 pounds. Hi Zooey, do you know if carrycot is suitable for overnight sleeping? Thank you! 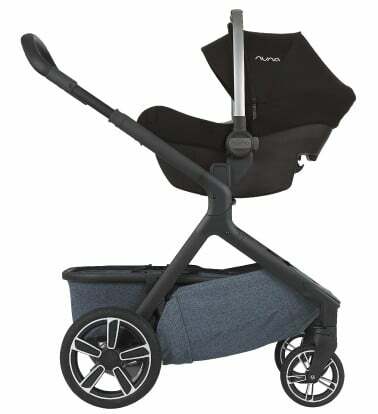 Do you know if the cup holder or snack tray for the Nuna Mixx are compatible with this stroller? Does the Nuna Demi Grow Stroller fit inside of the Nuna Wheeled Travel Bag? If not, can you please recommend a suitable travel bag? Apparently it wil only fit the frame though so where do they expect you to put the two seats? We need another option to fit the entire double stroller system if you have any ideas! Maybe check the travel bags for double strollers for example at Amazon, they should be big enough to fit the frame and two seats. It’s a cheaper solution than buying two Nuna bags..
How does the bottom basket detach when you are using both seats so you can still have storage? I Love everything about her this travel system except that you lose your storage w two kids. I’m having twins and already have a 3 year old so storage is a must. I can’t find anything comparable other than the City Jogger Luxe and then you loose ventilation and 10 lbs plus ease of operation. Hi Crystal! I attach the picture where you can see how the Nuna Demi Grow storage basket looks like. There is additional stiff bin attached onto the stretchy basket. You need to detach this bin before installing the second seat (you need to fold down the back of the stretchy basket as well). There are some straps inside this removable bin so you can carry it and use for example for shopping. When two seats are attached the stretchy basket is rather useless, especially if a bigger toddler sis on the lower seat. Even if you could fit there some items, your baby would touch them with his feet… So when you use Demi Grow as a double you basically don’t have a storage basket on a stroller at all. You can use the removable bin and carry it. But the whole point of having a storage bin is not to have to carry it right? In my opinion it’s a bummer that when you’re pushing Demi Grow with two kids you have to carry your things. I think Baby Jogger City Select LUX and UPPAbaby VISTA have better storage basket, fully useful even in a double version. Even when two seats are attached you can still fully load the basket. The access will be partially blocked (it’s a common issue on tandem strollers), but at least you don’t have to carry your diaper bag and other stuff. 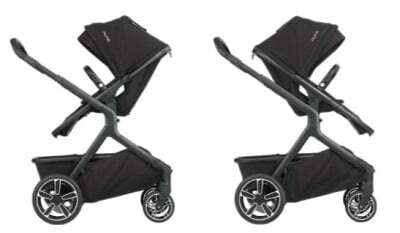 Therefore if the storage basket is important for you, I would recommend you these two strollers rather than Demi Grow (unless you’re okay with carrying your gear:)). Oh, and there’s one more thing. According to the pictures on the Nuna official website the basket is a bit different do the US and UK version!